Do you, or someone you know, have a major health challenge? Could you be doing more for your health? Do you have trouble finding the will, focus and know-how to initiate a transition? Are you confused and frustrated by all the contradicting information from so-called health professionals, leaving you stuck? Have you tried alternative therapies only to wind up worse off than you were before? Peggy McDonnell and Ken Brown of Angel's Health Institute understand the difficult road that accompanies the wellness seeker. Hear about their journeys through the raw food diet, the vegan diet and vegetarian diet. You will be astounded by their medically supported results and conclusions. Peggy McDonnell is a health practitioner, certified by most of the major alternative healing centers in North America. 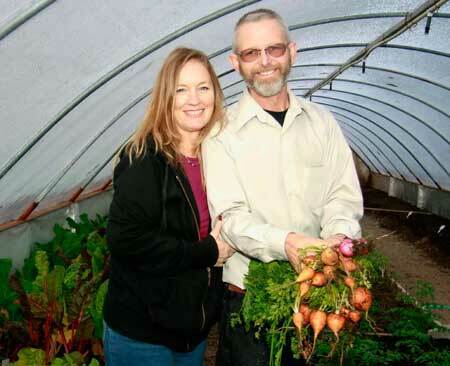 Peggy McDonnell and Ken Brown in one of the hoop houses. Angel's Health Institute invites you to join in on the growing movement in disease reversal and avoidance by way of proper nutrition with a whole living foods lifestyle and a solid education. Begin your journey in a supportive, friendly and comfortable environment set on a lush 23 acre farm in southern Oregon. Contact us for more information. Our alternative health center and programs can help reverse diseases and conditions such as naturally, for Cancer,Diabetes,Chronic Fatigue,Migraines,Heart Disease,Fibromyalgia,Lyme Disease,Digestive Disorders,Arthritis,ADD & ADHD,Autism,Leaky Gut Candida,and more.